Thanks for those terrific shots, Neal! 1982 was my first year at Reno and I'd never seen anything quite like Dago. Did those guys go on to do some work for Jimmy Leeward and "the Galloping Ghost?" . Who tweaked Galloping Ghost? I know it was nearly as faast when Jimmy bought it several years before. Last, If Dago Red could've reached it's full potential, would it have had the same potetial for structural failure problems as Galloping Ghost? At the risk of the townspeople lighting their torches and marching on the castle, you can't compare the two. One professional in every aspect, one not so much. And the results spoke for themselves. Did those guys go on to do some work for Jimmy Leeward and "the Galloping Ghost?" . Who tweaked Galloping Ghost? I know it was nearly as fast when Jimmy bought it several years before. Last, If Dago Red could've reached it's full potential, would it have had the same potential for structural failure problems as Galloping Ghost? Considering that Voodoo Chile had the same elevator trim tab failure as Galloping Ghost did, but opposite side, why couldn't it have happened to Dago Red? Neal, Thank you so much for the photographs and insight. Your words and photographs bring great memories back of super early wake ups, sneaking over/thru the pit fence and quietly watching the early preparations in the bitter cold. She sounded brilliant on those mornings, Strega too. It’s so strange to me now as it seems like it was not that long ago. To see those airplanes moving at those speeds, and making those sounds was incredible. If you have seen a “high speed pass” of a restored warbird Mustang the sound and impact of that plane is about 4% of what a racer would make. Whatever the ratio of the value a racer versus the “correctly” restored warbird Mustang has in today and tomorrow, as an enthusiast there was nothing like them. If there was big money in that spectacle that could be won by these racing aircraft, I have no doubt that Merlin engine parts would continually be fractionally improved and reproduced with the emerging printer technology. Long term, the sport of air racing always added to the vitality and survivability of the Mustang industry. I remember Stilletto’s wing, rejected by a UK museum as being “too far gone” to be used for static display, rebuilt with internal wing radiator coolers and flown at Reno after a 6month rebuild or something like that. Amazing stuff. While they “looked the same” to many spectators, they were all so different in preparation and details aside from the differing levels of professional care of those that maintained them. Seeing them each year was such a charge for me, as well as catching up with old friends Throughout the slow and dramatic build up towards Sunday afternoon. Please post more pics, or maybe start a thread again. While I love the restorations in their own right, nothing I have ever seen compares with the Sunday races of years past. Last edited by Joe Scheil on Mon Sep 10, 2018 5:42 pm, edited 3 times in total. Good question. I would say that first, the attention to detail and skill of the builders and crew chief is what protects a race plane from this type of failure. Different groups of people produce different results. Additionally a competitive raceplane should come apart nearly every year during the off season to have every detail looked at in fine focus by careful people. Lower budget teams did not do that and put a lot of trust onto the parts they were flying. While the failure event was similar, the causes and results were very different. One racer cleanly went near vertical and temporarily incapacitated the pilot. The other aircraft pitched and rolled and did not give the pilot time to recover his awareness. One was a purpose built racer from day one. Another was a pre 1970 racer continually modified by different folks without a significant expenditure of money or clear purpose after 1984. I will always remember N79111 as Race 69. Jeannie of 1980 was a historic plane who’s team wanted her to replace “American Jet” at NASM. The story of this photo flight is incredible reading and pure Skip. She deserved a far better fate than she received. Last edited by Joe Scheil on Mon Sep 10, 2018 5:48 pm, edited 7 times in total. Thanks Joe -- I've always thought of WIX as a "Warbird site" more concerned with how the stencils lined up and whether the washers were the correct color on the newest World War II spec restoration than on the postwar exploitation and development of the 1944 technology. I love the restoration stuff and the history as much as anybody, but I'm by nature and inclination a Racer. The really great experiences of my career have been things like standing at Pylon 8 on Sunday afternoon being blown away by the sheer impact of the sounds of a Rare Bear or a Strega blasting overhead at 3500 horsepower and 100 feet altitude. I'd rather talk to Bruce Lockwood about the impact on Dago's performance of new deriching technology than discuss the color of the paint in the wheelwells. Over 35 years of photographing the Races, crewing on the Racers, and trying to understand the explanations of incredibly bright and unbelivably motivated people trying to extract the last mph out of a 50 year old piece of machinery have left me with nothing but admiration for the men and the machines. It's been a Hell of a ride. The Reno Races as we knew them seem to be fading away, but the memories will always be with me. As long as there's interest I'll continue to occasionally do stuff like this here. My life has gone in other directions since I stopped attending Reno, but the memories and the photographs remain. And I just saw your post about the tail of the Ghost -- great post! Jimmy in his prime was one of the greatest stick and rudder Warbird pilots I've ever seen, bar none. But there was so much he just never understood about developing a Racer and especially about managing a Racing effort. Team management and attention to detail are the real keys to a successful and safe racing operation. That stuff is not seen or realized by the folks in the stands, but they are what make the show happen. I will always remember N79111 as Race 69. Jeannie of 1980 was a historic plane who’s team wanted her to replace “American Jet” at NASM. The story of this photo flight is incredible reading and pure Skip. A most excellent post, sir. And I agree with your points. And thanks again for the pictures Neal. Not my picture, but I've always liked this picture of when they took Dago Red to the Pomona Drag Races. 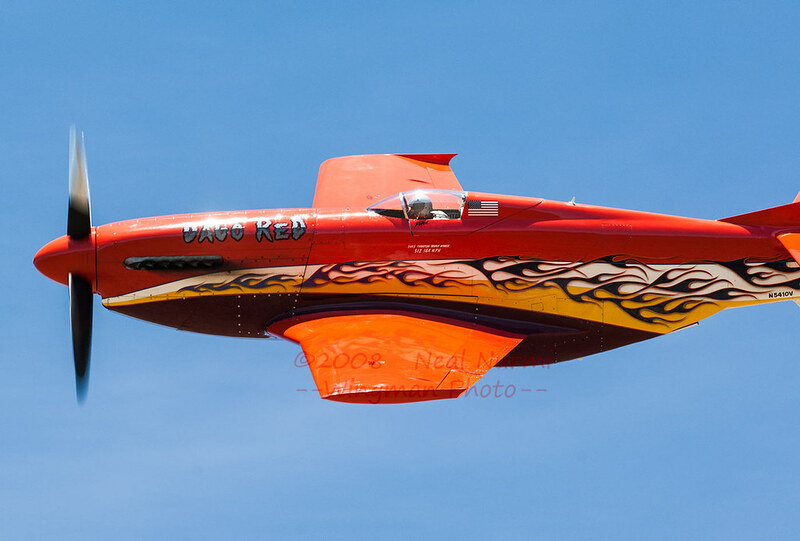 They are doing a live feed from the air races starting on Thursday, go to airrace.org . Just thought I'd say this: I'm decidedly more of a historian type, and get much more excited about restored fighters than modified racers. But I absolutely love it when you guys expound. It helps me understand, and thus appreciate, the race scene a great deal. I believe warbird lovers owe a certain debt of gratitude to racing, and besides, the stories are just plain thrilling. So thanks, and please keep it coming!